Reaching lofty Alpine heights on your own merits, the perfect silence surrounding you on the mountain and that moment when you finally reach the summit and find the whole world lying at your feet. All these things that you encounter and the effects they have on you when ski touring can’t adequately be put into words. Those already bitten by the the ski touring bug will find a veritable paradise in SalzburgerLand, with countless opportunities to participate in this sport and scale new heights. Beginners to the sport will find no better arena to get started. Scarcely any other winter sport has enjoyed such a big surge in popularity in the last few years as ski touring. Far removed from the hustle and bustle of the ski slopes and queues at tills and lifts, nature and mountain enthusiasts slide through SalzburgerLand’s wintery scenery, discovering locations and places that otherwise would have remained hidden to them. 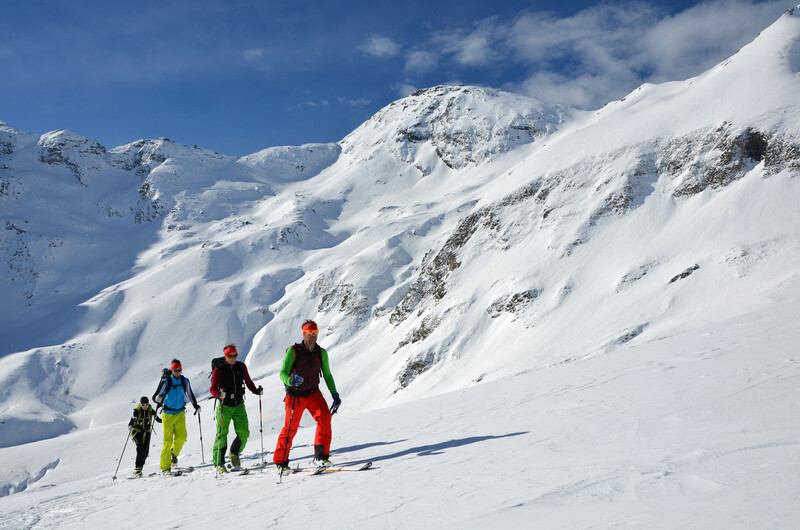 Ski touring is not just about scaling the highest peaks as quickly as possible or conquering the most challenging piste. It is about finding your own speed, setting your own limits and finding the terrain and heights that are most suited to you. The sport is absolutely perfect for those looking to leave the stresses and strains of everyday life behind them, for those wanting to do their body, mind and soul the world of good and for anybody who wants to just get out and enjoy nature in winter at its most beautiful. It goes without saying that you must bide by certain irrefutable rules when ski touring; not just for your own safety but that of others too. If you stick to the following, keep a cool head and have your wits about you at all times, there’s nothing standing in the way of a perfect ski tour adventure. Take heed of avalanche warnings and chat with the locals about their assessment of the dangers. Plan your tour taking avalanche warnings and weather forecast into account. It’s sometimes best to stay at home and wait for better conditions than to head out. NEVER (even when there’s a low risk of avalanches) set off without the appropriate equipment (avalanche transceiver, shovel, probe, fully charged mobile phone). This goes for all members of the team, and those who don’t have everything must stay back at the base. Check your avalanche transceiver before you set off – your life could well depend on it. Go carefully on steep slopes (leave 10 m distance between others on the ski tour). Always go alone into steep slopes, you should leave at least 30 m distance between other group members on gradients of up to 35 degrees. You should avoid slopes of up to 35 degrees when the risk level is 3 or above. You should ensure that you are ascending at the right time of the year. Sunshine, changes in the weather and time of sunset should all be taken in to account and thoroughly assessed before you head off. © SalzburgerLand Tourismus – Enjoying the beautiful mountain panorama. 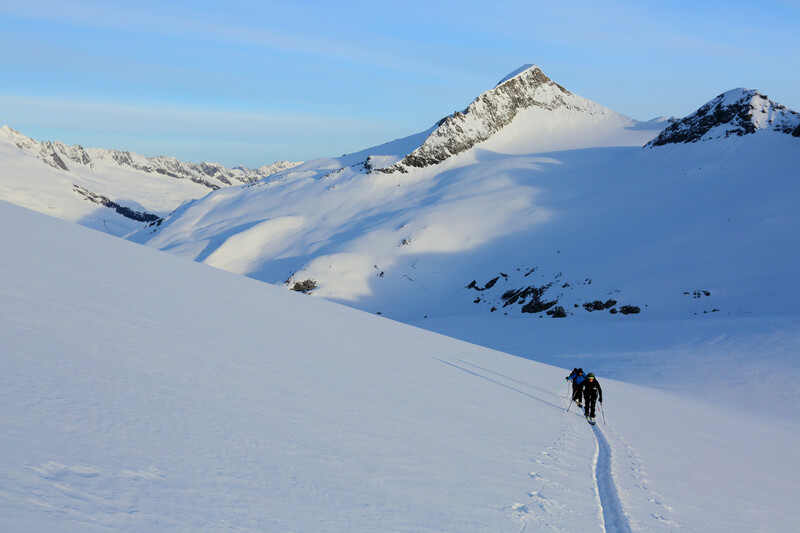 Beginners and or those who aren’t quite certain in the snow or who are a little unclear on safety and risk assessment should never make their way up the mountains alone. All over the region there are high-quality guided tours available. Not only can you be certain that the guides meet all the safety regulations, but you’ll also learn a great deal from them. How to correctly use probes, avalanche transceivers and shovels, how you can tell when the weather is about to turn are just a few of the things you will find out. The new “Ski Touring Atlas, Salzburg – Berchtesgaden” is indispensable for anyone who wants discover our wintery Alpine world on their own. Beginners and experienced high-alpinists alike are sure to find the perfect route from the 550 tours in this book. It contains 18 regions, 110 maps, detailed tour descriptions and an introduction to avalanche safety.